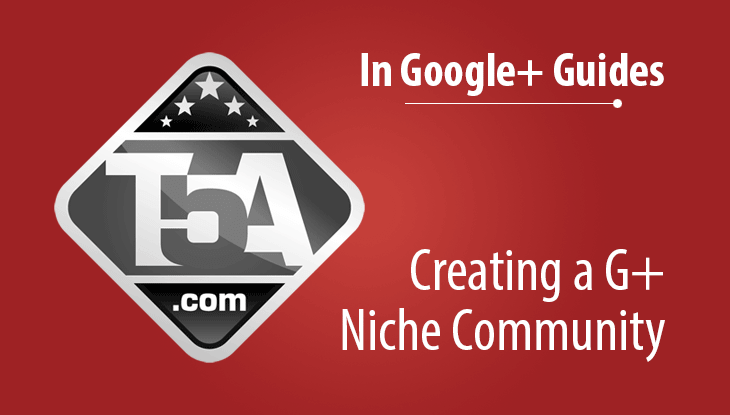 Did you know that you can create a community based around your Google+ Page niche? One of the best ways to bring awareness to your Google Plus Page is to create a community and then put the work in to make that Google+ Community a success. On the upper right of your Google Plus screen, click your profile icon and then switch to your page. Click or mouse hover over the “Home” button on the left. Click Communties in the drop down that occurs from following #2. Click Create Community and follow the steps. A Warning: If you create a Community under your Google Profile (free) and then decide to change ownership to your Google Page (free) you will have to assign your Page as a moderator, and then wait two weeks before you can make your Page the owner of your Community. Instead, following the above diagram, you can create your Community under your page and save having to wait 2 weeks to switch it. 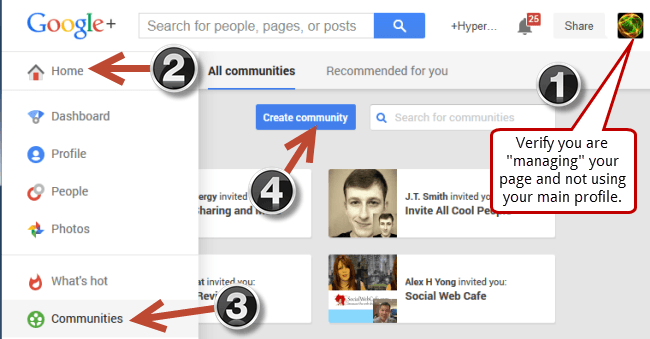 In order to create a Google Plus Page around a Google Plus Community, you have to begin by creating your Page. After you have logged in as your Page, click on the drop-down menu to the left of the main screen and select Communities. Then click the blue button that says Create Community. Since the name of your Page appears prominently on the upper right hand corner of the Community, the chance of people circling your Page increases. As the number of Followers increase, your visibility soars as well. Your Page is linked to your website, which increases SEO value because – again – as more people visit your traffic, your online reputation grows. Any community members that join will count as a +1 for your Page and social signals have the potential to positively impact your SERP rankings in the future. The above will appear on your page (with your community details) which advertises your Google Plus Community. Therefore, you’ve got a nice cross-pollination occurring where your community advertises your page and vice-versa. By linking your Community with your Page, any content that is posted in your Community can be collected and curated on your Page. A highly active Page will obviously be followed by more people. Finally, by making your Page the owner of your Community, you will comment and engage in other communities as your Page, which also enhances your visibility and online authority. Truly, this creative collaboration of your Community and Page can spark many benefits and position you as a thought-leader in your industry. Take advantage of these brilliant tools to forge a strong relationship with your audience that is based on trust and sharing.